The hotel is in a great location with very comfortable beds and a double massage shower. There are many amenities on site. The only problem we had was the smoky smell of our room and not being able to sleep because of the noise in the hallway. A fan could have helped. The location on the water and very close to the convention center was very convenient. The room smelled like smoke and we did not get any sleep the second night because of loud guests and nothing to drown out the sounds. The value for the type of room met my expectations. Even a best western does that. In addition, it didn't work in the room and the staff did not know how to correct the problem. The hotel is in a great location. The common areas of the hotel are currently under renovation. 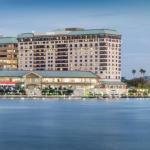 The Westin Tampa Harbour Island, located next to the Tampa Convention Center, gives easy access to local attractions, including St. Pete Times Forum, Old Hyde Park Village, Westshore Plaza, International Plaza and Bay Street, and Busch Gardens. The Westin is a 15-minute drive from Tampa International Airport and just one mile from Amtrak railway station. Highlights of the waterfront property include a business center, pool, restaurant, gym, flexible event rooms, Westin Heavenly Dog Beds, signature bath amenities and in-room safes. The hotel provides an array of guest services such as laundry / valet and Service Express®. Spacious comfortable suites and guestrooms offer Heavenly Showers® for a refreshing bath, signature Heavenly Beds® for a good nights sleep, cable channels and movies for entertainment, refrigerators for storing snacks and drinks, and grab bars in bathrooms for the convenience of differently-abled guests. 725 South, a chic restaurant on the property, serves meals in casual ambiance. You can enjoy drinks and food with other hotel guests during Unwind(SM) every evening. Savor pastries and Starbucks coffee at the Market Place. The hotel boasts thirteen function rooms for corporate and social events. Some rooms even offer spectacular views of the harbor. The Westin provides both self and valet parking facilities. High-speed internet access is available for a fee. The Westin boasts a comprehensive range of amenities for convenience, confidence and comfort. Most of the guests were pleased with modern clean rooms, comfortable beds, well-kept bathrooms, food at the restaurant, location and efficient helpful staff. However, some visitors complained about musty smell in rooms, damp carpets, substandard food at the bar, ignored room preferences, parking fee and poor shuttle service and limited room service. Parking: Yes, there is parking. The hotel charges a parking fee ranging from USD 15.00 to 20.00 per day. Pets: Yes, pets are allowed.